"The mark of death remains forever!" 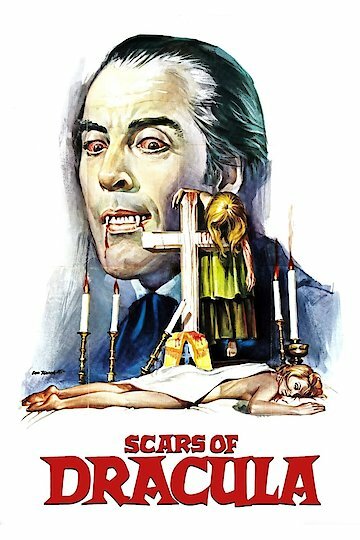 Scars of Dracula is a horror film released in 1970. Taking place in the time when Counts were in power, Count Dracula proves to be a hard and unforgiving enemy to those that act out against him, accompanied by a woman imprisoned to be his mistress. The mistress is found to be unfaithful and punished with death for her lack of loyalty. Paul, the object of Count Dracula's mistress' affection, is trapped in a high room of the Count's castle and lowers himself down with a rope only to find himself trapped in a room that contains only a coffin with no way to escape. Paul's brother and his fiancée set out to help Paul. Simon, the brother, and Sara, his fiancée, are assisted by a servant while fighting Dracula and the servant is overpowered and thrown over the castle wall. Scars of Dracula is currently available to watch and stream, download, buy, rent on demand at FlixFling, FrightFlix, Amazon, Vudu, iTunes, FlixFling VOD, Google Play, YouTube VOD online.